« 3. Please explain! My first complaint. I like the city on ANZAC Day. People talk freely to each other. It began at the bus stop, when I admired two men’s medals; colourful tributes to their service in Vietnam. A man on the bus asked me about the medals I was wearing – my Mum’s. She served with General Macarthur in Brisbane. On the 25th April, Sydney is free of traffic for 12 hours as the ANZAC march takes place. I arrived mid-morning, timing it well, as within minutes I could see the red banner of The 9th Division in the distance. My father had marched behind that banner in the Middle East and in New Guinea. It is a very distinctive, and there is no mistaking it for another. 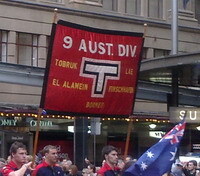 All the banners of the 9th Division bear the letter T, a symbol for The Rats of Tobruk. I watched each battalion pass, most men walking straight and tall, some assisted in wheelchairs, and others driven in jeeps to the applause of the crowds who had gathered. I followed the marchers along the march route, through crowds of people to Hyde Park, hoping to talk to some of the diggers from the 9th Division. But I was delayed along the way by talking briefly to an old friend I’d spied, and obtaining 3 memorial crosses outside St Andrews Cathedral. When I made it to Elizabeth St, the identifying banners were down and my link was gone. I took time to visit the War Memorial, something I have not done for a long time. In itself it is a deeply moving place to visit, with it’s memorials and symbols. As I walked away I was drawn to the sounds of a pipe band, under trees in Hyde Park. There is something in my Scottish heritage that draws me to them. A few songs were performed, as a prequel to the Commemoration of ANZAC, to take place in front of The War Memorial, when the march had finished. I stayed. This is the first time I had attended this post-march Service. The earlier rain had now cleared to a sunny sky, and it was inviting. Scots College pipe band heralded the Commemoration had begun. Their flag bearers flanked either side of The Pool of Rememberance, bearing multiple flag’s in our red, white and blue. The officail party included Don Rowe, of the RSL, The Premier Kristina Keneally, Archbishop Peter Jenson, Lieutenant governor of NSW and our Air Vice Marshal, Major General and Rear Admiral. Quite a gathering! A crowd three deep flanked the Memorial pool, as well as invited guests, under two marquees. All their voices joined in hymns that filled the warm autumn air with a sense of respect and honour. The service men offered prayers and both the Premier and the Archbishop spoke from personal experience of their links with ANZAC. The haunting notes of The Last Post were played by a solitary bugler, an offering to recall the fallen. With the aid of The Welsh Choir the National Anthem was sung, with the three service commanders in salute. This was visually very moving. When the service was over I made my way to a bus stop via The Cenotaph, magnificently laden with floral tributes. On 25th April every year it carries the memorials of a grateful nation to our war dead. My last stop was Northern Suberbs Crematorium where I delivered the crosses I had been carrying.Three family members are there, my Mum, my Dad and my Aunt, close in death, in the War Memorial section of the gardens. All three had served their country during WW2. This daughter of a digger will not forget. A moving and fitting reflection! No. 5 A good bit of self-discipline! 3. Please explain! My first complaint. 1. The surprise was in the colour!